Working out is hard work. Whether you’re on the court, in the ring, or at the gym, you need clothes and shoes that will keep up with your performance and help you achieve your personal best. And if you’re not inspired to work out in your regular get-ups, it’s time to level up your gear. Get a free $25 Under Armour eGift Card and get fired up! Under Armour sells high-performance clothes and shoes for men, women, and children. Since 1996, Under Armour has employed the latest technology to develop clothes and shoes suitable for any sport and weather condition. Using high-performance materials such as sweat-wicking fabrics, Under Armour has become the outfitter of choice for athletes at both the professional and amateur level. High performance, after all, is part of the company’s mission, which can be summarized in five words: “Under Armour Makes You Better.” See the difference that Under Armour makes on your next workout. 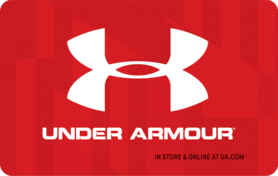 Use your $25 Under Armour egift card online at ua.com, or any of their stores in the United States.